Creating program flowchart with free templates and examples. Program flowchart has never been easier. The flowchart which shows the details of how to solve a particular problem of the program is called program flowchart. It is commonly used by the programmers while developing a program. It is a process of breaking down the design specification into a specific input and output, calculation and text manipulation, logic and comparison, etc. 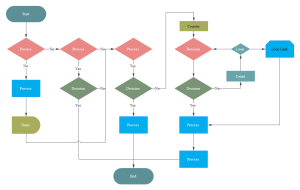 It is good practice to draw a program flowchart before writing a program because it is very helpful at the time of program testing and modification. In other words, we can say that creating program flowcharts should be the first task to plan the process of a system. 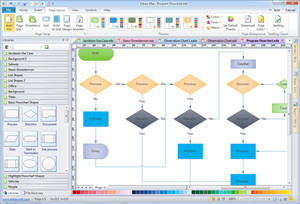 Edraw helps new and experienced users create Program Flowchart easily. Its user-friendly design makes you hard to believe the simplicity of drawing. It has a large collection of pre-made shapes and examples, allowing you to drag and drop any shape you want. You can also hand-draw or adjust the shapes using smart drawing pens according to your need. It's easy to format the style and colors by using Edraw automated tools. It's definitely worth a try because it could greatly saves your time and energy. We have meticulously created a program flowchart template readily accessible to download in vector format for your own designs.